The European bison (Bison bonasus), also known as wisent or the European wood bison, is a Eurasianspecies of bison. It is one of two extant species of bison, alongside the American bison. There have been three subspecies in the past, but only one survives today. European bison were hunted to extinction in the wild in the early 20th century, with the last wild animals of the bison bonasus species being shot in the Białowieża Forest in 1921 . European bison were first scientifically described by Carolus Lunnaeus in 1758. Some later descriptions treat the European bison as conspecific with the American bison. In 1996, the International Union for Conservation of Nature (IUCN) classified the European bison as an endangered species. It has since been downgraded to a vulnrerable species. In the past, especially during the middle ages, it was commonly killed for its hide, and to produce drinking horns. When and where you can see Bisons? 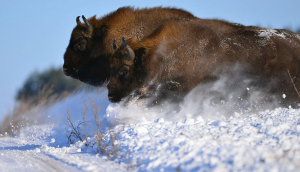 The easiest season during which to find Bison is wintertime, when food is scarce and large herds gather around the well-stocked feeding stations. The Babia Góra feeding station is known to attract dozens of animals, which are easy to observe. In early spring the herds break up into smaller groups which move arround a lot more. At this time Bison are often present in the forest clearings of Białowieża willage, Pogorzelce, Teremiski and Budy and Olchowka, Nowe and Stare Masiewo (northern Białowieża). Early mornings offer the best chance.